Silver-tone link bracelet with four color charms featuring "Dez", your friendly Journey spider. Perfect on your bracelet or necklace. "Girl Scouts Daisy 30th Anniversary" imprint. Silvertone iron with epoxy. 5/8". Imported. What fun! 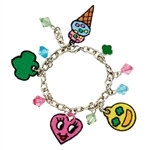 This charm bracelet features four 1" embroidered patches including a heart, ice cream cone, happy face and trefoil, all with polka dot backs. Color crystal beads and silvertone trefoil charm are the perfect finishing touch. Adjustable link chain. Silvertone and rayon/polyester charms. Made in USA.